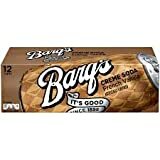 Barq's Red Creme Soda (made by the Coca-cola Company) is also available in a diet version (sweetened with Aspartame). Red Creme Soda (sometimes misspelled as "cream soda") contains no caffeine - unlike Barq's Root Beer which is caffeinated. Carbonated Water, High Fructose Corn Syrup, Sodium Benzoate (to Protect Taste), Citric Acid, Natural And Artificial Flavors, Red 40. 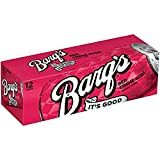 How Does Barq's Red Creme Soda Compare? Barq's Red Creme Soda contains 0.00 mgs of caffeine per fluid ounce (0.00mg/100 ml).